It’s good practice to respond to reviews that clients and customers write about you online, both good and bad. Both search engines and potential customers like to see that you take time to respond to reviews. Don’t have the time? That’s where ModernMarca comes in. 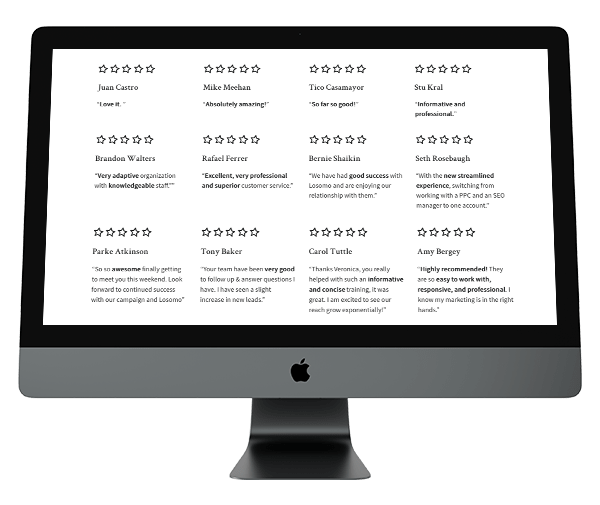 From email marketing campaigns to social postings, we help direct your customers and clients to well-maintained review pages. We can also help you create and manage social media pages and local listings where customers can leave reviews and feedback. It’s hard to respond to reviews if you don’t have any reviews to begin with. ModernMarca can help you come up with clever and creative ways to encourage your customers to leave reviews. In addition, we’ll handle negative reviews for you. We know that bad reviews can be disheartening. That being said, it’s important to respond courteously to those who voice negative opinions, whether you consider the review legitimate or not. Taking the time to address customer concerns and offer genuine apologies will reflect positively on your business. Responding to positive reviews with sincere thanks shows that you care about your customers. Responding to negative reviews politely shows that your business is always striving to improve. ModernMarca can help you turn negative reviews into positive opportunities. We’ll create on-brand responses that address concerns, provide value for future customers, and invite others to check out your business.